Bradley station opened as Bradley & Moxley station in 1862 on what was originally a broad gauge line built by the GWR. Closing in 1915, the station had a short shelf-life and its demise seemed to fly in the face of the Wolverhampton Chronicle's initial excitement at its opening: "It will prove a great convenience to the inhabitants of the two localities named", they announced! 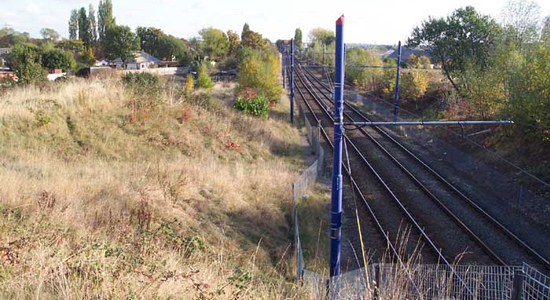 As can be seen from the photograph above, there is nothing immediately recognisable as railway history at the spot where the old station once stood. Above we see the site of the old station taken from Bradley Lane bridge, November 2003. However, behind the photographer is the Bradley Lane Metro Stop - a service which has breathed new life into a long-forgotten route. 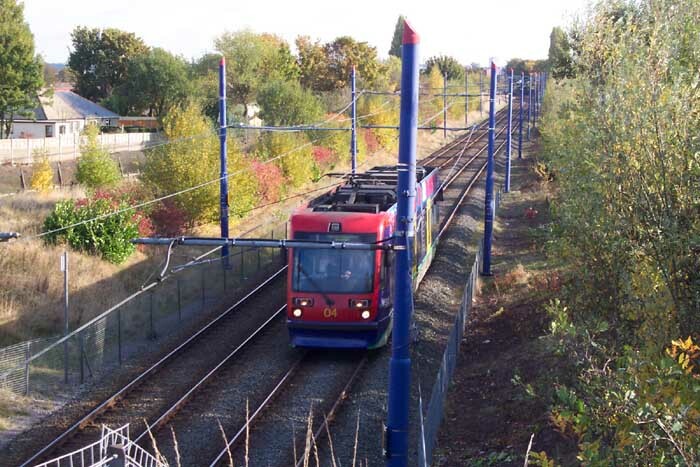 In the above photograph T69 Tramcar 04 passes the site of the old Bradley station as it is about to pass under the Bradley Lane bridge and pull into the Bradley Lane Metro stop on its way to Wolverhampton St Geroges.